Ecosummit TV: Oliver Lünstedt, CEO of Carzapp, pitches the German p2p car sharing startup. While there are already 3 peer-2-peer car sharing startups in Germany, Carzapp is the first one to have developed their own hardware solution called ZappKit. The ZappKit enables wireless car access with smartphones used as digital keys. The magic hardware box also includes GPS and an immobiliser that prevents theft. Moreover, the Berlin-based startup has an idea for the cost-efficient rollout of electric cars and participates in the electric mobility showcase Berlin-Brandenburg by adapting their platform to support p2p electric car sharing. Carzapp is backed by angels and looks for €1M to enter the German market in the first half of 2013. Ecosummit TV: Ecosummit and Climate-KIC, the EU programme to foster cleantech entrepreneurship and education, joined forces to organise an evening of Smart Green Business Networking in California. The Ecosummit Lounge Silicon Valley took place on 6 September 2012 at the famous Plug and Play Tech Center in Sunnyvale. We enjoyed 2-minute pitches by the 13 European cleantech startups that participated in the Climate-KIC USA Startup Tour to Silicon Valley, Washington and Boston. On behalf of all startups on the tour, I would like to thank Climate-KIC for supporting us. Ecosummit and Climate-KIC, the EU programme to foster cleantech entrepreneurship and education, joined forces to invite you to an evening of Smart Green Business Networking in California. The Ecosummit Lounge Silicon Valley takes place on 6 September 2012 at the famous Plug and Play Tech Center in Sunnyvale. Doors open at 18:00, at 19:30 our programme starts and we network until 22:00. We will enjoy 2-minute pitches by the 13 European cleantech startups that participate in the Climate-KIC USA Tour to Silicon Valley, Washington and Boston. At the lounge, we also serve you short presentations by the hosts, a keynote by Mark Perutz of DBL Investors, tasty drinks, finger food and all that Jazz. 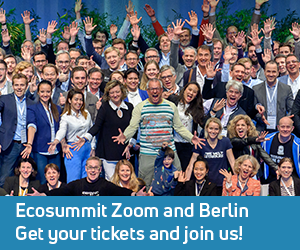 Tickets for the Ecosummit Lounge Silicon Valley are available for $30,00. We look forward to seeing you soon. Ecosummit TV: The closing panel of day 1 of Ecosummit 2012 in Berlin focused on supporting smart green entrepreneurs in the early stage of the startup process. The panel was presented by Climate-KIC, the European incubator network initiated by the European Institute of Innovation and Technology. Sebastian Matthes, technology section editor of our media partner Wirtschaftswoche, moderated a very informative conversation with Agnes von Matuschka (Center for Entrepreneurship at TU Berlin, University), Dr. Alexander von Frankenberg (High-Tech Gründerfonds, VC), Dr. Ingo Potthof (UnternehmerTUM Fund, VC) and Dr. Maximilian Horster (Climate Neutral Investments – South Pole Carbon, Startup). A couple of interesting issues came up during the panel discussion.